NASA leader Raila Odinga addresses his supporters at Uhuru park recently. Courtesy photo. Raila Odinga has announced he will be sworn-in as President through the People’s Assembly and get into State House on December 12. 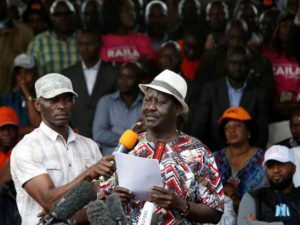 The NASA leader withdrew an earlier statement against this shortly after Uhuru Kenyatta and William Ruto’s swearing-in at Kasarani stadium on Tuesday. The People’s Assembly is part of NASA’s multi-pronged strategy to end Uhuru’s rule. “Uhuru Kenyatta is not the President of Kenya. We will not be sworn-in like (Ugandan Opposition leader Kizza) Besigye. We will be sworn-in like it was done with (Emmerson) Mnangagwa in Zimbabwe,” he said. Chaos broke out before the Opposition leader could finish his speech; police moved in to disperse his supporters using tear gas and their guns. They fired many shots and teargassed Raila’s convoy, forcing the supporters to hide between cars. The people and leaders left after police remained firm and opposed their assembly. Besigye was sworn in on May 11, 2016, a day before incumbent Yoweri Museveni’s inauguration. The politician, who belongs to the Forum for Democratic Change, was arrested several times after the country’s disputed February 18 general election. “Winner of the 2016 election, after swearing in as the new President of Uganda,” the party wrote on Twitter on that day. Police arrested him as he addressed a crowd in Kampala after the ceremony. Zimbabwe’s events were different as Mnangagwa took over after Robert Mugabe was forced to resign, ending his 37-year rule.